Most people have some type of insurance coverage – homeowners, health, auto, life, etc. However, most people are not able to fully interpret the language in an insurance policy and therefore don’t always have a full understanding of whether they are adequately covered or not. This is especially true when it comes to homeowners policies or commercial property coverage. As a result, lots of folks may find themselves thinking they had coverage that they don’t or may even find themselves to be underinsured and didn’t realize this until it’s too late. Do you understand what your insurance policy actually says? The purpose of insurance is to reduce your exposure to the effects of particular risks. Insurance serves as a means to indemnify you after a loss and put your property back together to it’s pre-occurrence condition without costing you anything out-of-pocket other than any applicable deductible. Not having insurance at all is taking a huge gamble and hoping that things work out for the best. 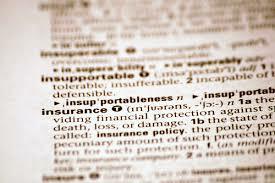 Having a full understanding of your policy language and how that relates to your coverage is of the utmost importance. Some insurance companies have gotten sneaky with their policy language and have begun to include language that protects them instead of you the policyholder. This is particularly eye opening when a policy includes language specifically concerning the discontinuation of products or materials such as shingles, siding, brick, and tiles and flooring. This becomes an important policy exclusion to coverage when you find that you have damage to one room of your home and the same materials (flooring and paint) continue into the next room. Now there is no match of the materials and the insurance company won’t pay for the undamaged room so now you’re in a bind. Standard policy language allows for a full replacement rather than repair when the product can no longer be purchased and has been discontinued or is otherwise out of date. Some policies now include language specifically excluding this issue and stating that they “are not required nor do they guarantee a match of materials” [policy language taken from a Homesite Insurance homeowner’s policy]. They state further that “the repair is intended to return the damaged property to a pre-loss condition without regard to cosmetic appearance,” meaning that materials used to make the repair “may vary in color, shading, dimensions, pattern, and composition” [emphasis added]. This goes directly against the purpose of insurance at a very basic level which is to return your property to the pre-loss condition which should absolutely include the matching of materials. Another concern that people don’t fully understand is being underinsured. This occurs when someone either doesn’t realize the full value of the property being insured or possibly are mortgage free and not required to have a certain level of coverage. Shortcuts are made to save money by lowering coverage thereby saving on premiums, hoping it won’t be needed (taking on the risk). If or when damage occurs and devastation hits, it’s too late. Make sure that you understand what your policy says and that you have the coverage you need to be made whole again. There are professionals who can help you with this.